(host of Hittin' the Road) & Carl Koop. 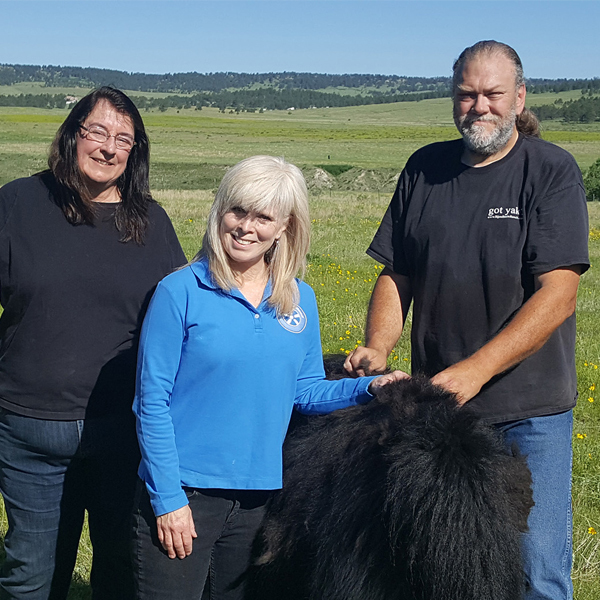 Here at Bijou Basin Ranch, we are a family-owned ranch that raises fully registered Tibetan yaks that have wonderfully glossy coats and produce a high quality fiber. If you haven’t knit with yak yarn (or a yak blend) before, you are missing out! Tibetan yak fiber is warmer than wool and has a softness similar to cashmere, making it ideal for lightweight garments and accessories. As yak fiber takes time to develop, we work with other ranchers in the western states and abroad in Mongolia to supplement the fiber needed to produce our extensive range of high-quality yarns. Of course, we think that the perfect way to care for your gorgeous knits in our yarn is with Allure Fiber Wash, which is made right here in the USA. This all-natural, biodegradable no-rinse wash is perfect for your special handwash-only treasures. After all, you spent so much time making something beautiful, it makes sense to keep it looking its best! I bet you don’t think ‘cute!’ when you think of yaks, but they are actually quite cute. We were recently interviewed for a PBS show called Hittin' the Road (click here to watch the episode!) which recently aired - you can check out the interview with Carl & Eileen Koop (aka, the "family owned" part of the business) at the 3-minute mark in the video linked above. It's worth clicking over for the immediate joy of seeing our yaks frolicking in a field - who knew yaks were so bouncy!? Well, we did, but people don't usually believe us...now we have video proof! If you haven’t had a chance to touch a skein of yak yarn before, we hope to see you at one of the many yarn shows we are attending this year. We'll also be sharing some new hand-dyed colorways with you later this month, so stay tuned for more updates! New Colors from MJ Yarns!